We had my sister over for her Birthday for Calzones and she made it clear that she did not want any meat by saying, "I don't want any meat with my pizza!" I thought about putting meat into the calzone anyway since it was not a pizza because that seemed like the big brotherly thing to do... But I decided I would save that sweet act for another day. I had just gone shopping for three different calzones that all were to have meat, so I had to improvise with what we had! Enjoy! (Alternately you can lay dough on a solid flat surface covered with wax paper and squish flat with hands. Roll into a ball and slam the dough down onto your solid flat surface covered with a piece of wax paper. Using your fist mush the dough down repeatedly as if you were punching it softly but firmly (this helps get any air bubbles out of it.) Now using your finger tips press and stretch dough until you have formed a 12 inch spherical calzone skin. Melt 1 tbsp butter, mix with fresh crack pepper and 1/8 tsp garlic powder. Toss all calzone ingredients together in a large mixing bowl. Place calzone on baking sheet lightly coated with corn meal. Arrange your oven racks to where they are on the upper and lower thirds of the oven. If you are using a baking stone as we do place it directly onto the floor of a preheated oven for 45 minutes(but you will be less likely to ruin your pizza stone if you place it on a rack at its lowest position.) Place baking sheet with calzone on the top oven rack and bake for 20 minutes, move calzone on baking sheet to lower rack, brush with butter mixture, then slide calzone onto pizza stone, brush with butter mixture and continue to cook for 15-20 minutes or until bottom is crispy and top is golden brown. 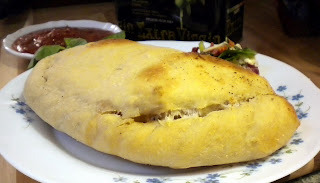 Slide calzone onto a cutting board or baking sheet and slice into 4 pieces and serve hot with marinara or your favorite dipping sauce (ranch dressing, honey and olive oil with balsamic and fresh cracked pepper our our favorites.) Enjoy! You should never be afraid to toss your dough! Just be sure the floor is clean beforehand, sometimes the dough lands there in lieu of your hands haha!